With the demand for online content so strong these days, it is easy to see why the demand for an article rewriting service is in high demand. A constant need for fresh blogs, reviews and articles for marketing purposes mean that there is neither enough time nor enough material to constantly be producing brand new texts, but older content can be cleverly used again as long as it is given a complete overhaul. Search engine algorithms are becoming very good at spotting duplicated articles, and therefore it is important to make sure that any reworked content is fresh and different enough to pass as something entirely new. If you are running a business, you are unlikely to have enough time to manually rewrite all of your old material as this can be a time-consuming task. Not only that, but it also requires a skilled hand, since you want to ensure that the sense and flow of the text is preserved. Optimisation for SEO is another factor that needs to be considered when rewriting content, as without it your site cannot rise up the search engine rankings into a prime position. While it may be tempting to opt for one of the many types of spinning software that are available, these very rarely produce satisfactory results. Often the meaning of the text is lost, or the words fail to flow naturally. The best way to ensure a professional result is to use a professional article rewriting service, where you can be sure that a skilled human writer has manually rewritten your text to a high standard. There are many of these companies offering their services online. 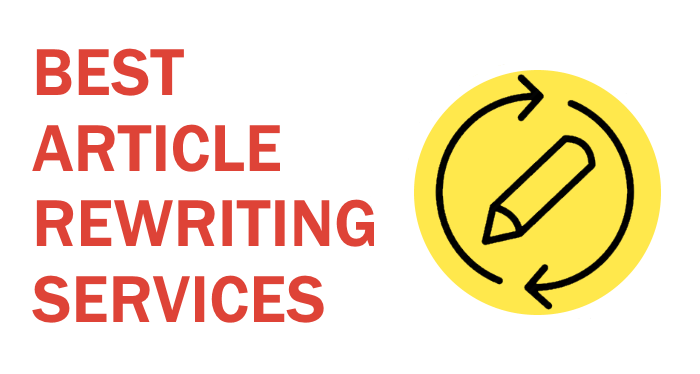 However, if you are looking for the best article rewriting services, then this list of the top 10 article rewriting service providers is for you. Upwork was established over a decade ago and is now one of the biggest freelancing platforms on the internet, linking employers with workers all around the globe. Writing and rewriting services are just some of the thousands of skills being offered on this site, with freelancers accepting projects as diverse as virtual office assistant tasks and data entry to graphic design and app development. Rewriting Cost: Prices can vary depending on the size and nature of the project you need rewritten and, of course, writers will be prepared to accept varying fees, however in general a small article can be rewritten for around $10. Functioning in much the same way as Freelancer, clients can search for a suitable freelancer to complete their rewrite by browsing through their profiles, or alternatively, they can post their project to the job board and receive job proposals from a range of freelancers who are suitably qualified to carry out the task. This company is at number 9 on our list, since there is no guarantee about how good a writer can be and some may turn out to have a poor grasp of native English. The Freelancer forum is the biggest freelancing marketplace in the world and is registered in Australia. Having connected over 23 million workers with employers across the world, it is easy to see why this a good place to find someone to rewrite your content for you. While this is not a specialist writers forum, as there are freelancers who cover all kinds of projects from app creation and website development to internet marketing and graphic design, there are a large number of skilled writing professionals who visit the site every day looking for work. The way the system works is that clients post the specifications of their project on the job board and then interested writers bid for the work, offering a price and outlining how they could meet the essential criteria. This company has reached number 8 on our list as the quality of writers can vary, and while some are excellent, there will be some who have less skill and who may not be a native speaker. Hirewriters is an online content marketplace that covers all kinds of copywriting, from Facebook posts and reviews to academic articles and blog posts. The remote writers can be from anywhere in the world and have to pass a vetting process in order to be allowed to write for this company, however it is at number 7 on our list as the quality can vary. As the client, you can choose the level of writer you want to take on your project, from a beginner to an expert. All of the writers are graded based on their skills, experience and ongoing performance, so choosing a writer at an expert level should guarantee you a reasonable quality of writing. Rewriting Cost: Prices are on a sliding scale from beginner writer up to expert and increase depending on the number of words required. Fees start at $1.58 for a 150-300 word rewrite from a beginner writer right up to $53 for a 3000 word article from an expert. All rewrites are also automatically checked through Copyscape before being submitted to the client, so you can be confident of unique-appearing text. Once a writer has accepted the rewrite, the client can communicate directly with them and make any requests. Clients also have the option of commissioning work directly from a specific writer, although the fee will be higher. Founded in 2002, Flatworld Solutions operates around the world, with offices in the UK, USA, Philippines and India. This company is at number 6 on our list thanks to the enormous choice of writing services that they offer. Their rewriting service centres around improving and enhancing existing content while adding value and driving up website traffic. Rewriting Cost: The rate for a basic rewrite from this company is 5.5 cents per word rising to 6.5 cents per word for a more complex project requiring additional information and added content. Other Services: Some of the other outsourcing services offered by this company including accounting, data entry, call centre and software development. Their rewriting service also encompasses a range of other genres including eBooks, research papers and brochures. Any amendments are carried out free of charge and a rapid turnaround time is guaranteed from the team of outsourced writers, who are all experienced in the field and who have strong SEO optimisation skills. At number six in our list for convenience and range of services provided, Outsource2India offers rewriting services across a range of genres from essays, magazine articles and educational books to standard web content and blogs. Rewriting Cost: The cost of a basic rewrite starts at 5.5 cents per word, with a rate of 6.5 cents per word for any value added information that is required to be added. Other Services: As well as offering a range of writing services, Outsource2India covers a wealth of other outsources services including software development, photo editing, finance and accounting, data entry, mortgage services and call centre operations. Using a team of skilled writers, this company offers a tailored rewriting service designed to accommodate the needs of the client, including intensive rephrasing, syntax adjustment and rewording to create a unique new text. The idea behind their rewriting service is to bring new life into old articles and to refurbish existing content into an SEO optimised and appealing piece of writing. Established in Pittsburgh USA in 2009, The Content Authority is at number 4 in our list thanks to its professional and talented team who offer good value together with a personalised service. All of the remote writers working for this company possess experience across a variety of areas of expertise and have a passion for writing. Rewriting Cost: The price for a standard article rewrite is $0.09 per word however for a more customised approach, clients can opt for a direct order to a writer of their choice in which case the pricing structure is more flexible. Other Services: As well as offering rewriting, The Content Authority offers a full brand new content writing service in a range of genres including eBooks. Rewrites will be reworked from existing content provided by the client on a sentence by sentence basis and are guaranteed to pass Copyscape as unique and original material. Offering an impressive range of writing services, Content Development Pros is in third place in our list thanks to their 100% satisfaction guarantee promise and quick turnaround times. Rewriting Cost: Prices start at $9.95 per page with unlimited revisions included in the fee. Other Services: As well as an article rewriting service, they also offer the services of writers for a number of custom projects from eBooks and websites to press releases and ghostwriting. All work is carried out by a team of experienced writers, with all work being reviewed multiple times during the submission process so the final draft is guaranteed to be of the highest quality. Established around a decade ago, Content Development Pros guarantee SEO optimisation and affordability, with all work passing Copyscape. This leading content company has a presence in over 20 countries and is constantly expanding. Over the last 2 years the company has grown considerably with a highly experienced writing team that comes from a range of academic and professional backgrounds, including graduates and post-graduates in a range of subjects from English literature to business administration. Other Services: Godot Media offers a broad spectrum of services including an article rewriting service with SEO optimisation. Some of their other specialisms including proofreading, translation, social media management and content marketing. Thanks to their professional service and reasonable prices, they stand at number 3 in our list. Vappingo is one of the best known article rewriting service providers on the market having been around for almost a decade. This company provides a range of writing services including content rewriting, and every job is handled by an individual editor who remains in touch with the client throughout the process. All writers work remotely and can be based around the world, however each one has a degree in their area of expertise and produces high quality writing. Rewriting Cost: Their rewriting fees start at $0.045 per word for a 72 hour turnaround which rises to $0.050 for a 48 hour turnaround and again to $0.060 if the article is required urgently within 24 hours. Other Services: As well as offering rewriting services, Vappingo also offers an editing and proofreading service for existing documents. Orders can be submitted 24 hours a day and all prices are provided up front, with no hidden costs or fees attached. Clients can check on the progress of their order at any time and can communicate directly with the writer in order to request modifications. Thanks to their quick and convenient service with transparent pricing, Vappingo have the number one spot in our list. GoSuperb is one of the newest companies in the field, having been put together in 2015 after its founder repeatedly experienced frustration in dealing with existing content writing companies. The ordering process is simple, can be completed online, and some fill-in forms quicken up and clarify your requests for rewriting. Their in-house writers, who hail from a broad range of professional backgrounds and areas of expertise, have been rigorously selected to ensure everything is written to both a native and market-beating standard. All of their articles are run through Copyscape as standard to ensure brand-new content and for a standard turnaround article, prices start from $1.25 per 100 words. If you find but one grammar mistake in the piece you receive, a full refund is guaranteed. Additionally, any dissatisfaction with the content presented is met with free redrafts until you are completely content with your content. This assurance of a high standard and very little stress, propel them to top spot on the rewriting list.